Happy New Year! 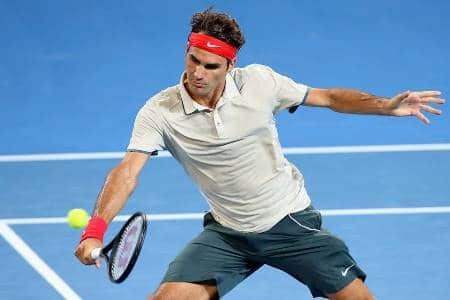 And with it we get straight back into tennis with Roger making a winning start at the Brisbane International defeating Jarkko Nieminen 6-4 6-2 to move into Friday's Quarter Final. Having not seen Fed play since the World Tour Final loss to Nadal I had no idea of what to expect of him or the new racquet but he came out razor sharp, had some serious pop on his groundstrokes and played a very clean match to say it was his first competitive outing in well over a month. I was also very pleased with how quick the courts were playing, the ball was really flying out there and it was good to see some first strike tennis being played for a change. Both guys started this one at a frenetic pace, in fact I don't think we saw a rally over 10-15 shots in the first few games, just 2 guys going for their shots and looking to take the initiative at the earliest possible moment. At 2-2 Nieminen looked like he was about to hold to love but then a sweet lob, a nice chip charge play from Federer followed by an unforced error saw him pegged back to deuce, that became break point and Roger took it in style by maneuvering Nieminen around the court with his forehand. Nieminen had an immediate chance to break back but it was soon snuffed out with more strong serving and big forehands as Fed moved into a 4-2 lead. Both players then traded holds before Roger served it out comfortably to take the opener 6-4. The loss of the first set seemed to frustrate Nieminen and he went from playing aggressively in the first set to completely red lining his game in the second. Had it come off he may have made a contest of things but Roger managed to break him immediately before holding, breaking again and then saving two break points to take a 4-0 lead. It looked like bakery products could be on the cards but Nieminen finally managed to pull out 2 service holds but it was nowhere near enough as Roger served it out to love to take it 6-4 6-2 in 1 hour and 8 minutes. This one was a dream start really for both Federer and his fans and I'm not sure you can ask for more. Movement was spot on, groundstrokes looked very powerful, he still showed great touch and most importantly played very aggressively. He also served very well and just looked to be a lot more confident in his play, no hesitation or not quite going full blooded on shots which I think was quite a surprise considering it was his first match. I expected some rust but there wasn't any. He also dispatched a very handy opponent in straight sets, I know he leads the H2H with Nieminen 14-0 after today but he is a very competent player (made QF's at 3 out of 4 slams) and has 2 titles both of them coming in this part of the world on similar surfaces at this time of year. Unfortunately for Nieminen he seems to peak around January but by running into the Fed-express he had no real chance. Next up for Roger is Australian Marinko Matosevic and the two have never played before. I think this will be a good test as like Nieminen, Matosevic is a good player, has a big forehand and a fairly decent serve. He was the Aussie number 1 for most of last year and had a decent win vs. Verdasco at Monte Carlo so he knows how to play. However I think this record in Australia is very poor and by beating Benneteau in the first round here it was his first ever win down under. Facing Federer probably won't be too exciting a prospect for him and I can only really see Federer winning in straight sets. 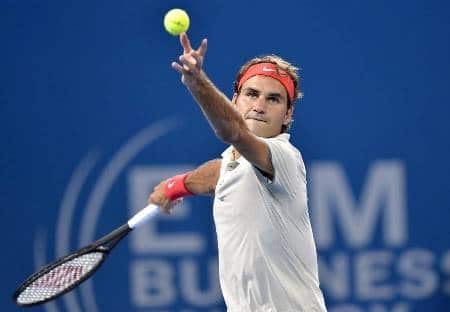 It should be another fast paced encounter with both guys going for their shots but if Roger hits the spots on his serve he will be able to create enough break point chances to come through unscathed. Fed in 2: 6-4 6-2. Will I be joining Roger with my first win of the new year as well? What a way to start the new year. Top of the 2014 first comment leaderboard. Wonderful to see Roger playing in my own time zone!! Great stuff from Roger, couldn’t have ask for a better start. Playing doubles with Mahut will help him too. Roger has started the year off with a bang no doubt. I was very impressed with this match. Not a tonne of rallies though so it’s hard to evaluate how effective his training session and recovery has been the last 6 weeks. So far, the main thing is that he is looking healthy and his movement is looking like it’s back on track. In particular, Roger is arching his back quite low which is a great sign and his serve was popping in the 200s quite often. Courts are playing pretty quick which is surprising so it begs the question if this is what is to come for AO or Tennis Australia is trolling us all. Too early to tell but from my perspective the racquet is paying big dividends already, he’s generating power especially on the backhand and is playing more aggressively at the net. He’s not looking rusty and his mentality on the court seems to say he’s already more confident than half of the 2013 season. Good signs for the 2014 season, needs to get off the mark and get some match wins and winning feeling back to have any chance of being contention for number 18. I am treasuring the tennis being in my time zone finally and cannot wait to see what Fed does in Melbourne with Edberg. Allez! Indeed looked sharp. Good movement, big groundies. 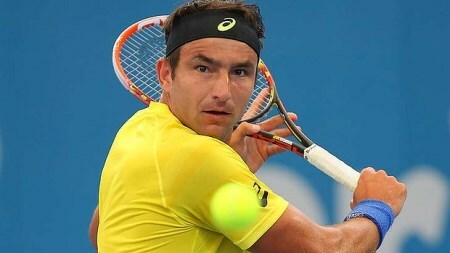 Matosevic will be a good test. Hey Alysha, what a great comment. You just summed it all up !!! Happy new year miss Wintour !!! Don’t worry, I won’t call you that forever !!! Hey perfect comments, agree with them all! Certainly more power although only able to watch highlights as couldn’t find live stream here in UK!!! Loved the dubs highlights, proves my theory that better singles players will always come out on top! The oppos serves were way too formulaic and easy to read. And Murray was beaten in 3 by Mayer, which we all saw coming as match fitness/ focus will br a bit of an issue for Andy T this stage! I’m note sure about the mentality bit. He was bellyaching about a missed backhand and during the doubles match, his composure was clearly reflecting the success of his shots. He is regrettably not quite yet the Roger of AO 2013. Maybe he will be. I thought his serves were not quite there, landing quite often 30-40 cm from the lines, though they got better toward the later part of the Nieminen encounter. I was quite impressed with the touch that he displayed with this new racquet, perhaps little less during the Nieminen match but there were quite a few sweet moments in the doubles. Interesting observation about the arching of the back, and that there may be a change here. Could explain why his serve placement seems a little bit off. I disagree. We have no idea if this is the Roger of AO 2013. Could surpass that level or fall short, no evidence to suggest which one it’ll be right now. Showed some emotion after missed shots, not a negative though for me. yes interesting comment on the back Alysha, I’ll try to spot it in the next match. I dont know about the new racket adding power to the backhand, I thought it was the forehand that showed a more noticeable power up. It was really booming yesterday. Guess we’ll see how it affects the backhand too. But I agree with the rest of your points! Jarek, the serve looked pretty okay I thought. Some misses were big. but it was 61% first serves. And some of the serves were pretty huge too. Backhand should be more powerful if the racquet is lighter, less strength needed to hit higher bouncing balls. I’m listening to Roger Rasheed commenting the Federer/Mahut vs Dimitrov/Chardy doubles and from what I understand the courts at the AO will play as fast as in Brisbane and, he says in addition, as fast as they played since the nineties. We’re u able to watch live?? On what stream? And I like the outfit!!! Things def looking up! Happy New Fed Year everyone! Gosh it was fun 😀 Great to see him in a good form moving well, hitting ball fast and powerfully. I was concerned if the big frame affected the precision for serving but he served well, didn’t he? Impressive stats too, especially 2nd serves points won. Hope AO courts play like Brisbane’s. Yeah I hope RLA is quick like this. Heard rumours it might be but guess we gotta wait and see. So the AO might become the faster of the two hardcourt grand slams eh? That would be pretty ironic. But that would show that the organisers really listen to the fans and players. I’ll give you that one Jonathan – but Federer wears it so much betterer!!!! Well, there goes the hope of seeing a Rafa vs Andy match after almost three years. Andy just lost to Mayer after beeing a set and 3-1 up…. I guess he was injured…. Forget to mention, kudos to Mayer for playing great and hanging on and believing he could win…. What? Murray is still injured? Did he look in pain in the match? I heard his back was sore or something. Dunno though. Mayer hit a slice winner from the baseline. Unorthodox but effective. Yeah, Mayer picked it up when he needed to and just at the same moment murray went down. I got to admit it was an interesting match, I enjoyed it 🙂 Mayer is a fun player to watch! Yeah Simon, what is up with these players like Mayer, Kamke and Brands??? They are becoming better and better and are not afraid of the top guys…. Mayer is fun, weird shots but very effective. He’s scored some big wins in the past. But of course the GOAT always defeats him. Oh and deep deep respect for Kamke. What a match he played. If only he did not have that last double fault…. You know they say Rafa is the only top 10 player left at Doha. So if he wins, it will be because there is no one left in the top 10. Is that not the same situation as Roger at Brisbane? I read so many comments saying, well, besides Roger there is no big player in Brisbane…..
Ps: I am watching his doubles match right now. Kind of fun. More Roger vs Dimi. Mahut is also really good. Chardy is trying I think…. Saw of Gulbis pretty easy. No surprise I think, Gulbis FH is so bad, probably quicker courts work against him. Happy New Year everyone! 2014 started on a good note with this victory for Rog! I watched him play today after 4 months and he looked really sharp. I tried to keep my expectations low with the new racket and the start of the season rustiness but it looked like I didn’t need to. The kit looks pretty good too! No Mirka in the box. I hope she comes sometime soon! I gotta ask this though- Was it because he came in way too often that I thought he got passed quite a few times and it’s nothing to worry about? Anyway, it was an awesome first match in that he looked in shape and quite healthy. Onwards! They were just poor approach shots. But they aren’t a bad thing, gotta try it. Still won 4 and 2. It’s a shame I couldn’t join live chat early in the match… hopefully on Friday..
Live chat on Friday from 8.30am ish GMT. And HNY to you all! Hopefully the next Fed match will be on Tennis TV as want to see more of this form! Didn’t look afraid of anything which is pretty much how he looked second half last yr! Real attacking on top of the ball tennis! Fab stuff! Happy New Year, everyone! I’m unable to see any Brisbane matches here. Grrr. Highlights…looking good. No one seems to criticize Murray when he losses early in a tournament. And no one criticized him when he cried at Wimbly 2012. BUT, they criticize Roger when he’s out early or cries ( AO 2009). Just thinking. Amazing match to start the year and Happy New Year to everyone!!! Yeah he’s top 4 still for sure. Ferrer should be nowhere near that. Not much to add really, pretty much agree with the comments made above. I was following the match on TennisEarth (a commentary site) and I could tell he was playing well because the point-by-point commentary had lots of points which according to the commentary went: “Federer/Nieminen hits a good serve, Federer/Nieminen works a forehand return, Federer takes control of the rally and hits a forehand/backhand/volley/smash winner.” Stats were looking fairly good as well, and the clutch plays on break points were evident. The only reason Nieminen won as many games as he did was because of his serve. If his serve was like his ground game it would have been breadsticks. I rate his ground game. He plays his shots. Easily top 20 talent, just bad mentally. Happy New Year everyone! Great start from Roger, the new frame really seems to add more pop to his groundstrokes and serve. Watching the match though he did seem a bit slow on the top spin backhand, he seemed late on it and I don’t think he hit any winners from the baseline on that side, just the one mid court on the passing shot. I wonder if the larger frame is a bit clunky through the air on the backhand. Only first match though! Hmm not sure on that, backhand was solid to me, he needs that to be a containing shot to help setup forehands. If he can rip the odd winner down the line then even better. Happy New Year, Jonathan! Boy, I haven’t commented in a while, but I’ve been reading! It seems like everything is coming together after a rough year for Roger. Making adjustments to the racquet and choosing to stick with it at the beginning of the season was the right decision, for sure. It’s clear that he’s confident again, and playing doubles will definitely get him used to the courts in Australia. His groundstrokes have a lot more power to them but my favorite thing of all was how much better he’s hitting his backhand! I really can’t wait to see what happens at the end of the week, but most importantly, the Australian Open. I think he can definitely get a great result there this year. Keep up the good posts! Yeah, can’t wait to see him playing del potro or djokovic soon with the new racket!! Hey all! Watch this! Great tribute to Fed/Laver! Great Poem, and love Feds expressions at the end! http://www.youtube.com/watch?v=HXR9c_SksLI. If my link doesn’t work, just look for greatest dinner of all time, Brisbane tribute to Federer and Laver . Enjoy! And Rog in a tux!!! Did anyone hear about Rafa’s response to hearing that the Australian Open courts would be quicker this year? Oh Rafa. yeah that was hilarious! is there a video on that? Link please Alysha. Would love to read that. Thanks!! Just saw it. Hilarious. Lendl on how to beat Novak. 20 seconds of being a badass. I wouldn’t want to be alone in a room with this guy. Simon, when Uncle Toni and his PR team aren’t there to control everything he says, we get the truth no? He made a similar rant after his IW2012 loss to Roger. He said something on the lines of, “If Roger tells them, they will make the courts faster”. And no, that time he wasn’t joking, he was really irritated after the loss. How dare Roger beat him? No es possible to beat dope, no? I watched parts of the AO2009 final and there were moments when Toni, with his mouth covered with this right hand, was clearly talking to Nadal right after he was losing points. Nadal made it a point to look up to Toni for answers. I’m telling you, without all that illegal coaching, which by the way Toni approves of, we would’ve seen a very different slam count for Roger. Yeah Dull pretending he has a sense of humour. 2012 IW one of my favourite matches. Hey Katyani, where d’you watch the doubles match! Can’t find any highlights of latest win v dimitrov/chardy!! Also 2:00, where Hawk Eye makes a SOLID blunder and Dmitrov falls to his knees in disbelief. Thks guys, just enjoyed the quality of this match on the highlights! Proper doubles skills on show, touch, angles etc. not the crass boom bash of current ATP dubs! Shows what quality players they all are. Hoping to watch Fed live tomorrow and join in some live chat! Hey Jonathan, what are your predictions for the Tour this year? I said end last yr I thought Berdych and Ferrer might start to fall down the rankings and neither of them hv got off to a great start! Fed to start a steady climb back to at least 3/4 by mid season! Predictions are I will probably get a wildcard into Wimbledon. I think Ferrer will stick around tbh. Berdych will be just there or there abouts, his game is too huge to just disappear but titleless season probably effected his confidence. Maybe 1 breakthrough but not sure who. Fed back in top 4. Hawk Eye needs to be eradicated. Trust the lines judges, or override only within the margin of error for the device and give the benefit to the lines judges. Hey Susie, I watch through Streamhunter. And if that does not work than Stopstream. Both are very good, but those ennoying advertisements, you know with the girls and stuff, so ennoying if you are a girl yourself !!! I hope the whole match is on YT so you can still see it…. Oh and Susie, Dimi’s blunder is gold…. Roger was smiling so much !!! I mean seriously, does Dimi not know he was playing the GOAT??? Such a bad ” call” by Hawk Eye! Hilarious! Katyani, try installing a plugin called adblock plus (I use it on Firefox) it takes ALL the adds away, including the ones on streaming sites and youtube (I also use streamhunter). And did hawk eye miss that by about 30cm?! Rog hit it too hard for the machine to follow haha! You mean those are actually adverts Katyani?? I thought Sarah from Leeds actually wanted to meet me with no strings attached. Better cancel the hotel. Hey Simon, thanks for the advice. Those stupid ads are every 5 or 10 minutes. I will try to do what you wrote. May not work in one time (in my case definitely) so I might ask you again. Remember, I am still in the “knowing how to link an article”-stage !!! Oh and Jonathan, your comment ++1 !!! Amazing!! And everybody was so hilarious after that 🙂 🙂 Even poor Jeremy who coudn’t do anything about it 🙂 No one but Federer could produce such a point!! We are so blessed, Sid. Hi everyone, this is my first post on this site. I have been reading your blogs and posts for quite a while, and really like the tone here – many posters possess technical insights, and are friendly and light-hearted. Great comments from Niemenen, he´s such a great guy. And he is right Roger did play really well and again today against Matosevic, looks realy promising. Niemenen seems a really nice guy. It’s good, in this era of people saying Fed’s finished, to have someone give him some praise for once. All hail the King Sid! I really think Federer will be looking to absolutely destroy him, just to prove a point. Yeah, wrong by one game, but as I predicted, he got owned. Likely Winners: Del Potro, Djokovic or Federer. Dark Horses: Berdych, Tsonga, Janowicz. Early Upset (before SF): Nadal, Ferrer. I like that prediction, I guess my own would look a lot like that. It´s depending on the draw of course also. Nobody will have Federer in their quater, right? Berdych, Jerzy, Tsonga all a nono from me. If the courts are fast as Brisbane then Nadal may struggle but don’t write him off! Hoping Stan also starts off well this yr again! Monfils currently bringing his gd end yr form with him, wld like to see him back in top 20! Delpo has never done well at the Aussie so not pinning the money there. Still think Muzza will hv a gd run but my money is on Rog if he gets gd draw! If courts are fast and it stays hit, he will like that!! Pity Marinko self destructed mentally. Would be good for Roger to stay in a competitive match for another 20-30 minutes. He really needs mileage on this racquet. I think that is what he is looking for right now. Most probably, he is hitting the practice court after this match to keep him self from peaking to early during the AO. Roger moves really well right now. He self destructed big time, I actually hope he was injuried because othervise I would say it was an embarrising attitude from him, not running for the balls and putting up a juniors attitude in between points. And it would have been great to get some more match time with the new racquet yes. It´s really great for him he chosed to play the doubles also. Hey good prediction! Apart from the opening game Rog all over him! Vv quick today! Anyone else but me that are really hoping for a Federer-Hewitt final now? Could be a great atmosphere for such a final, and a good match up for Roger right now getting to hit a lot of balls against a fighting Hewitt. Would prefer to see Nishikori. His game reminds me of Novaks, good returner, good BH DTL (if I remember him correctly). That, I think, would be good test of Rogers level and tell him what he need to do in before Melbourne. Not sure if Hewitt can match the consistency of Nishikori who has also got an 80’s coach in Chang! Hoping for a Fed singles and dubs triumph here!! Hey gd call! He was all over him and vv quick in all areas today! Looks a new man so far!